in 1960, US MSW grew to 234.5 million tonnes in 2014. Alongside this, recycling and composting also expanded from a mere 5.1 million tonnes in 1960 (a 6.3 per cent recycling and composting rate) to 81 million tonnes in 2014 (a 34.6 per cent rate). This has been achieved despite no national recycling ‘law’ in the USA. State and local governments make their own recycling laws, resulting in a legislative patchwork across the country. State regulation falls into two major categories: landfill bans (for example, Michigan, Minnesota, North Carolina, Vermont and Wisconsin) and recycling targets (such as in California and Illinois). A number of states promote reuse and recycling by having deposit or refund systems for beverage containers (as in California, Hawaii, Oregon, Connecticut, Delaware, Maine, Vermont, Massachusetts, Iowa, Michigan and New York) and some cities, such as Seattle, and states like Connecticut, have mandatory recycling laws - citizens throwing away more than a certain percentage of recyclable materials in their waste can be fined. There are also voluntary collections and educational programmes where recycling is not mandated by law. Contamination of recycling has been an issue for a while in the USA, but few in the industry saw it as important, a situation not dissimilar to that of the UK. However, China’s year-long ‘National Sword’ campaign in 2017 – a regime of tighter import standards for recyclables – has changed the recycling landscape dramatically. This, together with a proposed 0.5 per cent limit for contamination from March 2018, has exposed weaknesses within the US recycling system, causing alarm across the country. An example of US recycling communications material. However, the China crisis appears to have brought about at least two positive developments. Firstly, the recognition that contamination is a serious threat to the entire US recycling industry, and secondly, a new motivation to do something about it. Many US industry figures believe that by allowing contamination to continue to this point, the situation is their own fault. Although the UK situation is different, the parallels are very striking, and with the China crisis hitting here too, the UK recycling sector is under pressure to get contamination under control. So what have the Americans been doing to address contamination and what lessons can the UK learn? In 2014, 65 per cent of respondents said they did not understand which plastics were acceptable in kerbside collections. In 2016, 44 per cent of adults ‘must rely on their own devices to figure out what can and cannot be recycled, information about the recycling process and other details about recycling’. In 2017, 51 per cent did not believe recycling reduces greenhouse gas emissions and 11 per cent believed recyclable material put in residential kerbside bins is mixed with rubbish in a landfill. of initiatives. 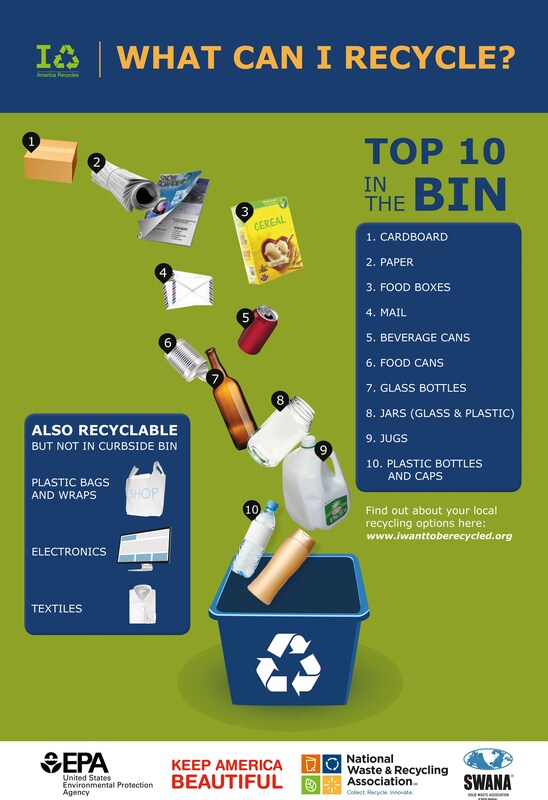 In 2016, Phoenix, Arizona, launched a ‘Top 10 in the Bin’ campaign, with a public service video promoted through social media and cable TV and supported by messaging in monthly newsletters distributed with customers’ city services bill. As well as what should be recycled, the campaign emphasised the top three items that should never be placed in recycling bins. Solid Waste Association of North America and the United States Environmental Protection Agency. In another national initiative, the Massachusetts Department of Environmental Protection (MassDEP) teamed up with nonprofit The Recycling Partnership and the municipalities of West Springfield, Lowell, Needham and Holden to pilot ways to reduce contamination and increase participation. Their aim was to develop materials for use throughout Massachusetts and, ultimately, across the US. Lowell saw increased contamination after switching to single- stream in 2014, but over three months in 2016 the MoreBetter Program reduced average rejection rates dramatically. Combined data from the cities of Lowell and West Springfield showed average contamination by weight dropping from 37 per cent to 26 per cent, with plastic bag contamination falling from 43 per cent to 15 per cent. The MoreBetter Program starts by identifying and quantifying contaminants and where they come from. This highlights materials that require specific targeting (like bagged recyclables, plastic film, food and textiles). The next stage is targeted information (such as specific feedback on bins through ‘oops’ and ‘thank you’ tags) plus in-home behavioural triggers (via magnets and information cards). In addition, mini campaigns focus on the top contaminant in each area. Broader recycling communications then reinforce correct recycling and build behaviours into everyday life. Finally, regularly updated ‘standing resources’ (websites and apps) become ‘go-to’ options to answer common questions. Texas has a number of different approaches across the state. Corpus Christi launched the ‘Dirty Dozen Recycling Campaign’ in October 2017 in response to high processing costs and 25 per cent rejection rates at its MRF. The one year campaign spotlights a new ‘unwanted’ material every month, showing how it contaminates ‘good’ recyclables. However, two other Texan cities have adopted tougher stances. San Antonio issued 2,400 warnings and 84 fines for contamination in just two months in 2016. Residents receive two warnings – one on their bins and one in the mail – before the city issues a $25 fine (which is added to their monthly energy bill). The city of McAllen has a three step process. Firstly, people are instructed on how to recycle. Secondly, inspectors examine bins and issue a first offense warning to homeowners failing to meet regulations. Finally, inspectors revisit areas to check progress. High numbers of ‘violators’ – as many as 300 in the first month after its launch – have been reported, but recycling increased from the usual 20-25 per cent rate to closer to 50-60 per cent on the routes with inspections and education. to manage their waste more sustainably is a virtuous circle, with communications at its core. Understanding and engaging local people, to disrupt negative behaviours (by tagging and rejecting bins, and fines) and encourage positive behaviours (via communications and incentives), is essential and not optional. This is probably the biggest lesson to take away: that cost- cutting and complacency has helped bring about the current crisis for recycling in many places, and that it will take a lot of hard work to get things back on track. The reshaping of the global export market by China may be just the thing the recycling industry needs to get its act together - if it can do it quickly enough.